Unity beta 5.4.0f2 “OpenVR failed initialization “ Hi there! VR: OpenVR Error! OpenVR failed initialization with error code VRInitError_Init_PathRegistryNotFound: "Installation path could not be located (110)"! I works with a DK2 and Oculus enabled, but not with a Vive and OpenVR. Is it possible to do AR with motion capture instead of image processing? Hello! We are using a motion capture system to track the position and rotation of a webcam and a small flat object. This data is then streamed to Unity where a Unity Camera follows the real webcam's pose and a 3D cube follows the pose of the other object. Finally, the webcam's output is rendered in the background using a webcamtexture. Is it possible to do AR with motion capture instead of image processing? VuforiaBehaviour.Instance.enabled = true doesn’t automatically reinitialize trackers I'm trying to re-initialize vuforia using VuforiaBehaviour.Instance.enabled = true as has been suggested many times in this forum. However, on doing so it doesn't seem to automatically reinitialize everything else like trackers/smart terrain/etc. Also, the callback registered using VuforiaARController.Instance.RegisterVuforiaStartedCallback doesn't fire on re-initialization either. How am I supposed to properly reinitialise the vuforia and all its components? 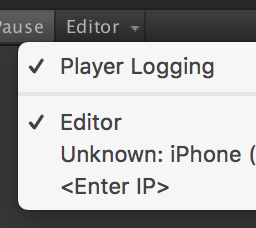 I just got Unity remote working and it's great! Just wondering though, is there a way to make it automatically connect to the iphone here? It just seems I have to repeat this step every time I press play and it would be nice to just set it once. File.WriteAllBytes help Hey there, I'm pretty new to coding and I'm trying to figure out how to write text files to the HoloLens. Got one method using the Microsoft storagefile class to work, but I'm trying to get my code running using the UnityEngine.Windows class and it doesn't seem to create a new file. I'll post both scripts below starting with the one that doesn't work. GvrReticlePointer not working when looking down I have a VR button in a game with Event Triggers for Pointer Enter, and Exit. The button works fine when it's positioned vertically in front of the player VR camera. But if the button is tilted over 45 degrees (in x-axis) the triggers stops responding. How can I place a VR button below the player for Exit or Paus a game (tilted 90 deg), using Cardboard/Daydream? Is the area below the player reserved for Daydream api or something? How do I record the iPad camera for use with ARKit? I want to have the ability to record only the camera feed from the iPad for my ARKit app. How do I achieve this? Can I record straight from the camera? Can I somehow record the application but use some culling mask to hide everything for the recorder only (I don't want to have to hide the virtual objects for the user while recording)? I want to then be able to replay this video in the app, replacing (or just overlaying on top of) the normal webcam feed. ARFoundation-based app not linking ARKit package correctly in Xcode?